Home / Amazing / Technology / Video / An Engineer turned a quadcopter into a fully operational, flying Star Wars Speeder Bike, amazing! An Engineer turned a quadcopter into a fully operational, flying Star Wars Speeder Bike, amazing! A quadcopter, also called a quadrotor helicopter or quadrotor, is a multirotor helicopter that is lifted and propelled by four rotors. They are largely used in the field of aerial imagery. Recent models are produced with a camera, Wi-Fi connectivity, and a controller or sometimes the pilot's mobile device can be used as one. 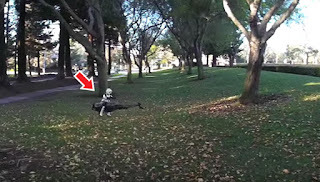 A test flight of the DIY Imperial Speeder Bike Quadcopter. Recently, quadcopters are becoming less expensive, hence, media outlets and newspapers are using drones to capture photography not only to capture paparazzi shots but also to capture beautiful aerial shots of sceneries. However, Adam Woodworth had a far more creative purpose for a quadcopter as he turned it into a speeder bike, also known as jumpspeeders or the open-air repulsor lift used in the Star Wars Universe, specifically in Return of the Jedi. He did it by strapping the bits of a 1999 Hasbro POTF speeder bike into the quadcopter and even equipped it with a stormtrooper on top to complete the look! If that wasn’t enough, he flew it around trees (remember that scene where Luke and Leia Skywalker were being chased by stormtroopers?) and even used the Star Wars main theme song as the background. Watch the video and see how he used to today's technology to recreate one of the most loved movie franchises!